The next #askmim request out of the hat was via instagram and from @scratch_london who asked for a “vegan dessert that doesn’t taste like cardboard”. 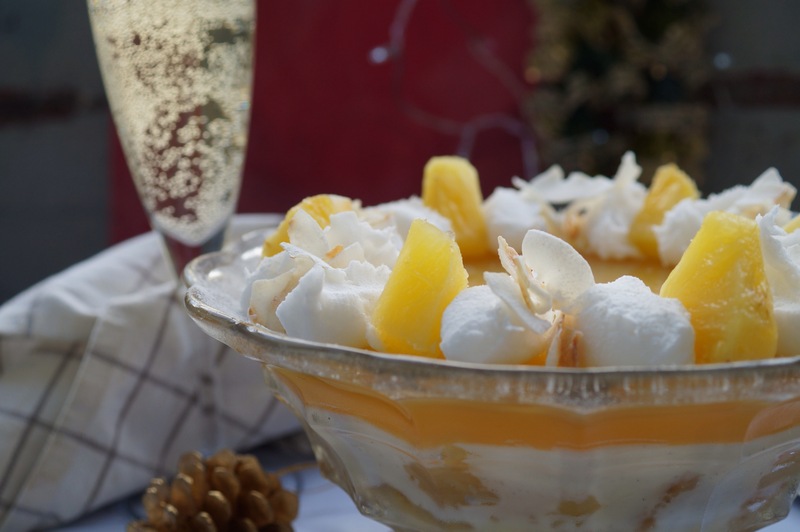 Well, as it’s Christmas I thought, what’s the least vegan friendly dessert?… I decided it was probably trifle…so I made it vegan! Love a challenge! So after many, many hours of testing the finished trifle is pretty jazzy – I hope scratch_london approves. It’s got all the traditional layers of jelly, custard, fruit, sponge and booze – just the vegan friendly versions! 1. Line a 20cm square cake tin with baking parchment and grease with coconut oil. Preheat your oven to 180°C. Whisk the coconut oil in a large bowl with 25ml of vegetable oil and slowly pour in the warm water. The mixture should thicken and emulsify like a mayonnaise. 2. Now add the caster sugar, vanilla extract and the mashed banana and keep whisking until well combined. Then add the flour and remaining vegetable oil. Pour the mixture into your prepared tin and bake for 30-35 minutes or until a skewer inserted in to the middle comes out clean. 3. While the cake is cooking put the pineapple pieces on a baking tray and pop it in the oven for 20 minutes or so or until the pineapple is tender and starting to scorch at the edges. 4. When the cake is ready, turn it out and leave it to cool completely on a wire rack. Then, cut into squares and use to line the base of a large glass bowl. Pour over 3 (or more) tablespoons of dark rum then top with the roasted pineapple pieces- reserving a few pieces for decorating. Set the whole thing aside while you make the coconut panna cotta layer. 5. Pour the coconut milk into a saucepan along with the caster sugar and the rum. Stir well to combine then sprinkle over the agar flakes. Bring the mixture to the boil without stirring, then start to stir the mixture until the agar has completely dissolved. Now turn off the heat and pour over the pineapple and sponge base in the bowl. Leave to cool, then place in the fridge to set. 6. 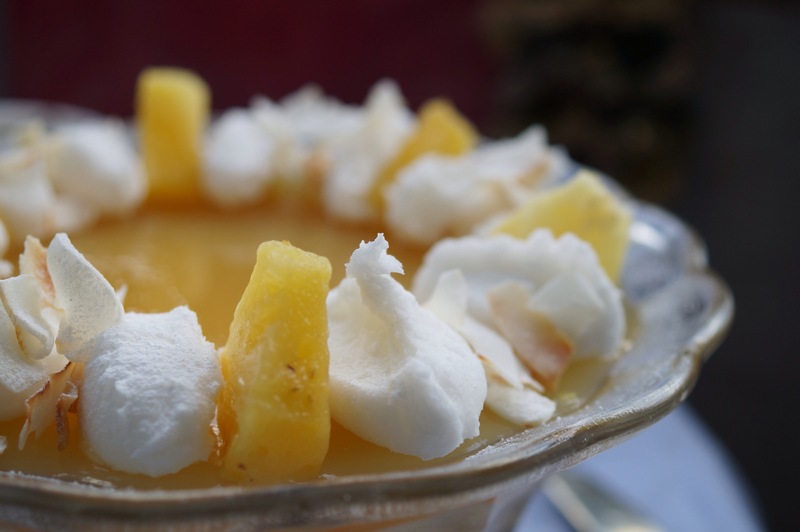 When the coconut layer has set make the pineapple jelly. Mix the pineapple juice, sugar and lime juice in a saucepan. Then, as with the last layer, sprinkle over the agar flakes. Heat until boiling, stir and then take off the heat. 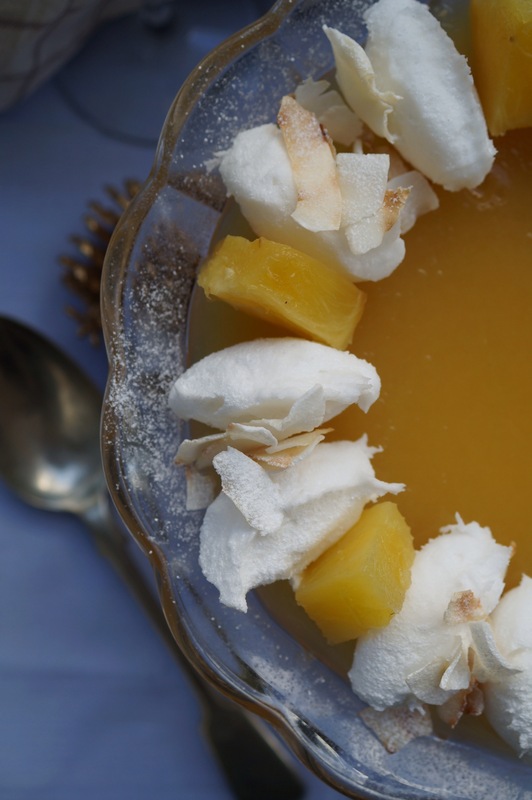 Make sure the coconut layer is completely cold and set before pouring all the pineapple jelly on top. Let this set and cool, then return it to the fridge one more time. 7. To finish the trifle place 50g of coconut oil in a bowl and gradually whisk in the icing sugar (ideally with an electric whisk). When the mixture is well combined but looks crumbly add a splash of either coconut milk or some finely grated creamed coconut which has been mixed with water. Just add a teaspoon at a time and keep whisking until it comes together to something of a similar consistency to whipped cream. 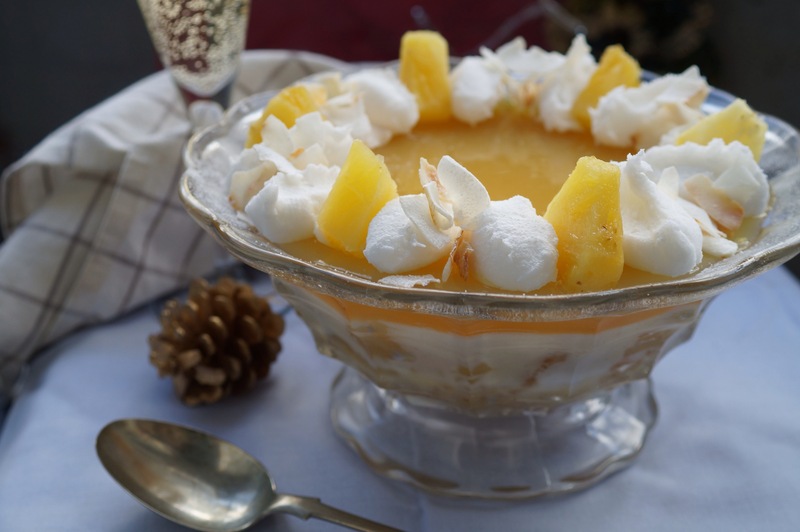 Either pipe or spoon this at regular points around the edge of the trifle interspersed with the reserved pieces of pineapple. Sprinkle over the toasted coconut flakes or desiccated coconut then dust the decoration with a little more icing sugar. Serve or chill until serving – should keep for a day or so. Wishing you fabulous festive funtimes! 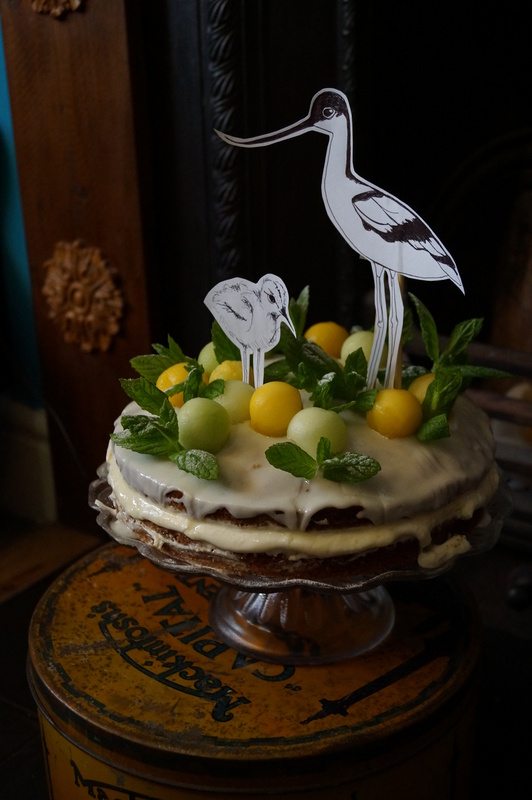 For this Easter Bank Holiday Weekend I thought it would be nice to post a cake recipe. But already I have a bit of a headache (which I think could possibly be attributed to an over consumption of chocolate eggs) so I’ve gone for a light, chocolate-free, fruity number! 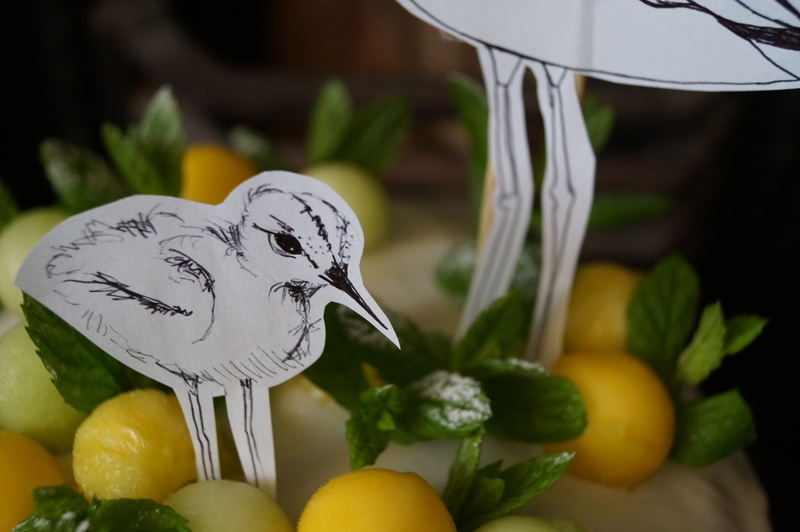 I made some fresh tropical fruit orb thingys to decorate it, which you can see as Easter eggs or as Spring flowers (or just bits of fruit), and then added some paper Avocets. 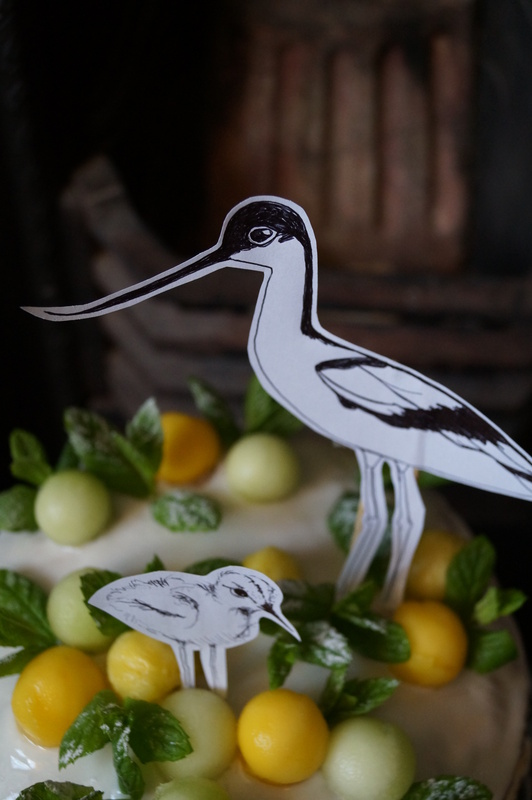 There’s nothing significant about the use of avocets, I just wanted to draw some black and white birds with long legs to give the cake some height and these wetland birds seemed to fit the bill…(sorry it that a bad joke?). Whisk in the oil then add the grated carrot and lemon zest. Use a melon baller to carve little pastel spheres from a fresh pineapple, mango and melon. 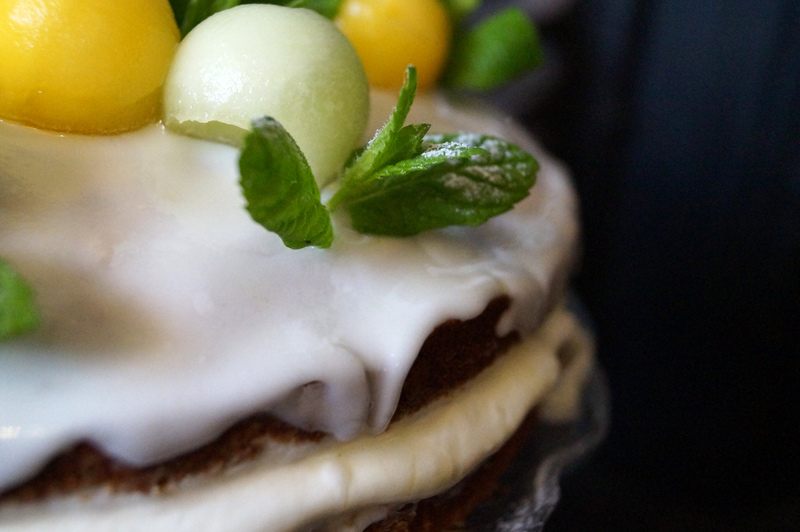 Ice the cake and then decorate with the fruit, mint leaves and a gentle snow flurry of icing sugar. 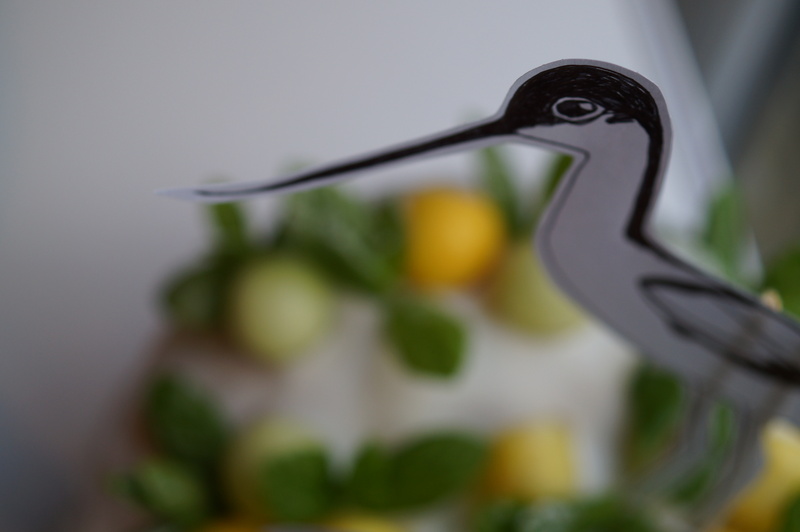 I added some drawings of avocets to mine, which I taped to cocktail sticks, but you can add your own drawings or any other cake decorations you like.